Last Thursday, Julian and Natalie went to their cousin Gavin’s second birthday party. It was at a bounce house and the twins just bounced and bounced. We all had a great time and even came out with some party scratches. Julian got a carpet burn on his chin and I did not realize how much this upset him until he told me a few days later that he needed a bandage. Friday we went to my sister’s wedding and Julian tried to hide his face in all the pictures and did not want his picture taken. Later he told me that he did not want people to see the boo-boo on his face. Poor little guy, I told him he is still so handsome with it. But it took my friend, Mary Ellen, telling him you could hardly see it for him to smile the next day at the pumpkin patch in his pictures. After the pumpkin patch we headed over to Jack & Reagan’s birthday party. Within only a few days we have been to so many parties and celebrations that we were all worn out. This is going to be another fun-filled weekend starting tomorrow; we have a Halloween party to attend after Natalie’s ballet class then Friday we are going on an excursion to Beech Mountain. Sunday I am hosting a baby shower for my cousin Kristy and the twins have been invited to two different church Halloween parties that day; then Monday night is trunk or treat at our church. All this sounds great except I was in the doctor’s office with Natalie yesterday and she either has a virus or walking pneumonia. I took her because her temperature had gotten up to 103 two nights in a row. She did not have a high temperature last night nor today, but her cough is still lingering. Julian also has this cough, but he did not have a high temperature. Last night Natalie did wake up many times crying and I would just rub her head or pat her back. It is so hard seeing your children sick and not being able to take the pain away. I know this is how my own Mother felt when I was dealing with infertility. She rode the highs and lows of infertility right along with me. At the time, I knew it may have been harder on her than it even was on me. Now that I am a mother, I am sure this is the case. I have heard it said, “A Mother is only as happy as her saddest child.” I am just so thankful that I had a mother that cared so much about me and was right there by my side through my struggles. Last night when I was rocking Natalie when she got up crying, I thought I hope I can always give her this comfort whenever she needs me. I recently read the most powerful parenting article that I’ve ever encountered. “Notes From a Dragon Mom” put all the mommy wars and daily parenting decisions into perspective. When speaking of “mommy wars,” I’m talking about the strong, and sometimes downright nasty, statements and judgments that are made in regards to various parenting decisions. While I love the internet for the vast information it can provide, it is frustrating with all the conflicting information and how people can hide behind their computer screens and launch cyber missile attacks at others. Pull up most any “mommy blog” and you can easily see the battle lines being drawn…breast feeding vs. bottle-feeding, attachment parenting vs. sleep training, daycare vs. stay at home parents, standard vaccination schedules vs. alternatives. A couple of blog comments are made and soon, the discussion has digressed into virtual mudslinging and hair pulling that gets us nowhere. I have opinions on each of these and if asked for advice, I’ll give it, but I am not going to degrade another person because they make a different choice. Children are raised in many different ways; and for the most part turn out just fine. Any parent wants the best for their children and looks forward to a long and bright future and makes parenting decisions based upon what they believe is best for the child and family. But, what if there was no future? Would you get so worked up because your child wasn’t hitting milestones as quickly as others their age, or didn’t get the highest grade in the class, or make the team? The future can be important and each parent should have some future focus when it comes to child rearing, but we run the risk of looking so far into the future, that we forget about today. Earlier this month was National Pregnancy and Infant Loss Remembrance Day, which I wrote as my message on Facebook. I received a few comments and likes as well, since it was asking to remember those who have dealt with this type of loss. I have discovered that once I tell people about my losses, then others open up about theirs as well. Many more people have experienced this than I had ever thought about. Some people I have heard makes excuses for it, such as, “the baby or babies must have had something wrong with them,” or “it just was not meant to be.” I am sure there are many, many more ways people try to explain the loss. I do realize that if I had carried to term any of the times, before Natalie and Julian that I most likely would not have them, but I do not think that erases my loss. I have come to realize that there are times in my life, I just have to say, I do not understand and I never will. That there are things in life that are much bigger than my mind or heart can ever comprehend and that God is God and I am not. Not try and explain away why miscarriages occur but just say I do not understand, but God does. This week has been one of those weeks where I have to say, I do not understand, but God does. Brian and I have been blessed to be members of a few different churches and a few different choirs and out of those three we lost two fellow choir members, both named Steve, at two different churches this week. One had been sick for a long time and the other was a sudden death, but both were our brothers in Christ and will be remembered as such. People have different ideas of when life begins, but for me it is at conception and that for my children always meant in the petri dishes, which were all lost at different stages; some before transfer, some known as chemical pregnancies, and others after thawing. Any way you classify them they were all still losses, 26 in all. I lost my father when he was 44 and my mother when she was 69. All of these losses had one thing in common: they hurt, but I know the story has not ended. This is what gives me hope and I believe many others who face loss as well. After church today Brian pointed out the house I grew up in to the twins, which is across the street from our church. Natalie looked and said, “Mom, there is your dog!” I told her that was not my dog now, but I did have one when I was a young girl. They wanted to know what happened to my dog, Do, and I told them he was in heaven with God. Natalie told me, “God will give him back to you!” Sometimes it takes my children to remind me of what God has to say. 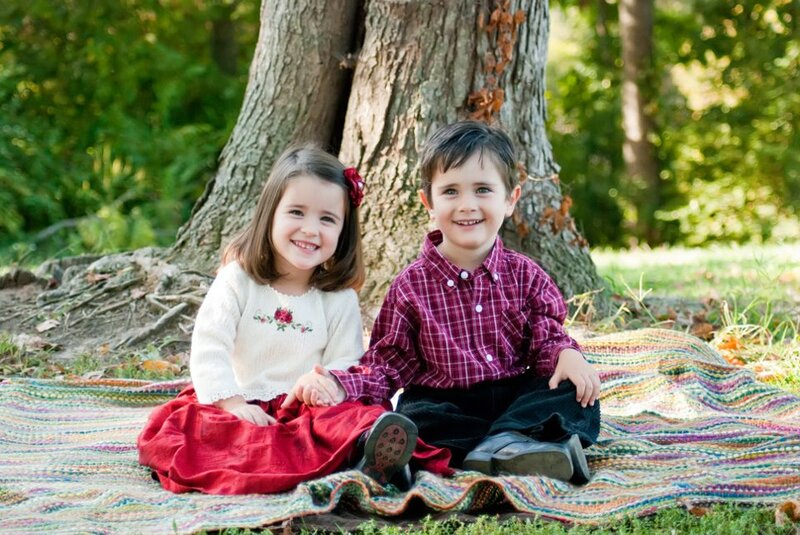 “I will repay you for the years the locusts have eaten — the great locust and the young locust, the other locusts and the locust swarm my great army that I sent among you.” Joel 2:25 (NIV) I know God has blessed me with Natalie and Julian if only just to remind me of what He has to say. My babies are 18-months old today. Hard to believe that we’re starting the downhill slide towards their second birthday. It truly doesn’t seem possible. I was going through pictures from this time last year and it is amazing how much they have changed. Grant still looks like Grant, but he looks so much more like a little boy than a baby. I think he’ll look the same when he’s six. Maria looks like a different child. She’s no longer all cheeks and her toothy grin and longer hair really makes a difference. When compared to their peers, they are still on the smaller end of the scale or else other children their age are huge. Whichever it is, 12-month clothes still fit nicely, especially on Maria; she even has some 9-month things that fit. When looking at her compared to other girls her age, you can really see how tiny her frame is and that she’s going to be petite, much like her genetic mom who comes in at a whooping 5’3” and 105 pounds. Last year, they weren’t even sitting up yet. Now, they are running and climbing on everything. Grant has figured out how to climb into the chairs on the front porch. It’s only a matter of days before he can climb on the couch, which will bring a whole new set of hazards. Maria “talks” nonstop. We’re not always sure what she’s saying, but she sure knows what she’s talking about. A few things are pretty clear though: cat, dog, HI, ball, who’s that? what’s that?, and uh-oh are common words and phrases for her. Grant has a couple of key phrases as well, including “odeyodeyo”. Your guess is as good as mine. They both have a version of “thank you” and I think are starting to say “drink,” which is an improvement over squealing and pointing to their cups. This year, they have established a love for the outdoors, which is fine by me. Just mention going outside and Maria is running to get her socks and shoes. We’re taking advantage of the nice weather after an oppressively hot summer and spending as much time outside as possible. What this is proving to me is that kids don’t need toys. Sticks, leaves, and flowers are so much more fun than any toy we have. Plus, watching people do things like sweep their driveways and mow grass is thoroughly entertaining. Grant was watching a neighbor sweep when he abruptly turned and ran to our porch. He moved the chair, grabbed the broom, and began to drag it around our driveway. They love to point at airplanes, wave at cars and talk to the neighbors. Their innocence is precious to me and I think their amazement at these ordinary things is a reminder to the rest of us to slow down and enjoy the simple things in life. I have learned over the years that everyone has a story to tell; some trial that they have dealt with or one they are presently facing. Whether, it is infertility, money issues, loss of a dream or so forth; the main difference in how the story ends is attitude and wisdom. When I was leading an infertility support group in Johnson City, one question I got asked, was why do some people get so many children (like the ones on welfare) while others who are good people and have money to support them cannot have them! Isn’t that the question of the year, for people going through infertility! As I went further through my journey of infertility, I began to see that I was not the only one going down this path or the only one who has ever experienced loss, disappointment, anger, rejection and so forth. That all I needed to do was to take my eyes off myself and put them on God and He would show me the truth. One of the lessons I learned, was that woman in the checkout lane with five kids and food stamps may also be hurting, but in a different way. That I needed to do what I could to help others and not let the seed of bitterness and anger grow in me, which it so easily could do after eight years of infertility. My dad used to say, “It is not what happens to you in life that defines you, but how you handle it.” This coming from a man who was physically and mentally abused as a child speaks volumes. He understood disappointment, pain, rejection and sorrow. Unfortunately, I did not know my father for very long, since he died when I was six, but others told me so much about him. The statements I remember most, was from a stranger or mere acquaintance not from my family. A man in my church, Mr. Asbury, told me when I was in high school, that my father was the best man he had ever met. A Godly man saying this about another speaks volumes. Another lady, who figured out who my dad was by my last name, when we were first introduced, told me that my father was a man of integrity. These people knew my father at different stages in his life, at one point while he was facing his trial and another when it was over. Yet, the statements showed the same he was the same person throughout what he was enduring. I wrote this before church today and while I was in Sunday school, I learned what my father must have had was joy since it is unaffected by circumstances. I realize now that is my goal in life is to have that joy no matter what is happening around you. I wish I could say that during my most horrific times in my life that I kept the faith or joy and did not waiver. But there were many times, I just wanted to give up trying to have a baby and I was not joyous during all of my struggles. I did not want to deal with doctors, shots, tests, but most of all loss. I am now so thankful for the wisdom God gave me to keep trying and not give up. Everyone’s story is different, even in infertility, but God showed me that I would not be less of a mother if my children did not look like me or have my blood running through them. Ironically, I think Natalie and Julian do look like me and while in utero, they had my blood running through them. With God’s grace I pray they will also have their Grandfather’s joy, which can only come from God. Having family pictures made is always a chore. Trying to coordinate everyone’s clothes and now that Natalie has an opinion of her own; it is even more of a challenge! I had already chosen outfits for us all to wear when I tried Julian’s on and they were too big (size 4) and then Natalie refused to wear what I had picked out. So I did what my Mother had always done with me, let me choose one and then she chooses one. Natalie chose the Scotty dog outfit and I chose the beautiful puffy rose dress. I am thankful that Julian will put on most anything I give him. Several days before the big shoot I tried to prepare them for it by telling them they would have to do as the photographer asked and if they did they would get a toy at the end. Bribery only works to a point, but the photographer gave Julian a 94 & Natalie an 88 as for Dad and I we each received 100’s, but without a toy! The first time I took the twins for a shoot was with this photographer at JC Penney’s, when they were 4 months old. The twins were both a handful, but Natalie cried and cried until she finally went to sleep. She was asleep in the hospital pictures before we came home and she has managed to fall asleep at all the shoots until she was around one. She has always been the one who would not cooperate, so I think an 88 was pretty good for her. We have not received all the pictures back yet only a few the photographer posted on FaceBook, which I am very pleased with. Our photographer, Megan, has always been able to get a great shoot even in the worst of shoots! It ended up to be an enjoyable experience, nothing like the twins first shoot when I vowed never to get professional pictures made again! People readily seem surprised at how well Grant and Maria eat. “I wish mine would eat vegetables; mine will only eat chicken nuggets.” My thoughts on this…they eat what they are given. Don’t want them to limit themselves to chicken nuggets, don’t feed them chicken nuggets. Jeremy is a picky eater and I was bound and determined to not have picky eaters. Maria has shown picky tendencies, but in taking our pediatrician’s advice, we just kept offering different options and textures. While she’s still a little skeptical when we offer something new, if allowed to serve herself, she’ll generally take to it. They don’t bat an eye at broccoli, squash, sweet potatoes, carrots, peas, cucumbers and love any fruit we’ve ever tried. I’ve also been experimenting with some new recipes and they liked the couscous salad and quinoa salads that had both onions and herbs. They also love my ranch tortilla wraps that have black olives and red peppers; Jeremy won’t eat them, but Grant and Maria can’t get enough. Kids don’t know what they aren’t supposed to like; I think we just assume that kids won’t like things and therefore end up giving them bland, fattening, and generally low-nutrition foods. Have you ever looked at the options on a kids menu? Very rarely are there any healthy options. I attribute Grant and Maria’s general good health to a very healthy diet which started at birth: exclusively breast milk for the first six months. Now that they are primarily on solid foods, we’re not taxing their bodies with excess sugars and processed foods and hopefully creating a lifelong foundation of healthy eating and long term health. I haven’t always been the healthiest eater, but have made great strides in the last 10 years and even more recently. I was recently told that I have arthritic knees and in addition to having misaligned knee caps, they also have bone spurs. The bone spurs explain the crunching noises my knees make when doing leg extensions, but I was a bit miffed at the diagnosis of arthritis. Doc, I’m only 31! How could I have 60 year old knees? The doctor tried to prescribe an anti-inflammatory, but I declined and told him I’d like to try it my way first. What’s my way? Figure out the root cause and treat that, rather than the symptoms. As I started reading, I’ve learned a lot more about our animal based diet and its relationship to inflammation, which can lead to joint issues and even larger heart problems. Additionally, it seems that the bone spurs could be caused by a calcium deficiency, which I will blame on my twin pregnancy. I decided to change how I was eating and started taking a liquid calcium supplement. What’s my result? After only a couple of weeks of the additional calcium and limiting my animal product intake, which includes eating red meat and eggs only once a week, and trying to do at least two meals a day without meat or dairy, my knee swelling is gone and the pain is significantly reduced. I’m pleased with the results and will continue. I wonder what else is improving inside my body? The more I learn, the more I attribute our issues with infertility to dietary and environmental factors. Our issue was one of extremely defective swimmers, which I figured was somehow linked to Jeremy’s work environment and lack of sunlight due to his third shift schedule. I now believe that his high red meat intake was also to blame. It wasn’t uncommon for him to have steak 4 or 5 days a week. And even though we bought “happy cows” (grass-fed, no hormones, organic, etc. ), that much meat is just not healthy. The work environment and schedule have obviously changed, and since Grant and Maria’s birth, the red meat intake has greatly reduced and vegetable intake has gone up. While I believe he could still do more to reduce his animal-based diet, perhaps the changes he’s made have impacted his swimmers. My fertility only returned about 4 months ago, so I wouldn’t be at all surprised if God decided to humor himself and give us surprise pregnancy. Guess we’ll just have to wait and see.